On 26th October 2018 the European Quality and Innovation Forum (EQIF) was held in Katowice. EQIF is a part of a bigger project named ‘Top Quality – Quality International’ that consist of several events taking place throughout the year in different places and touches the various areas. 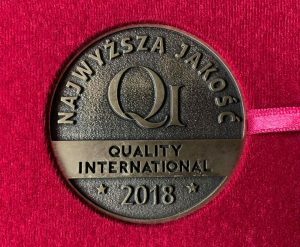 During EQIF there were a few award ceremonies held, among others the Highest Quality ‘Quality International 2018’ Award Ceremony, the Social Responsibility Leaders Awards Ceremonies – Dobra Firma (the Good Company), Dobry Pracodawca (the Good Employer), Eko Firma 2018 (the Eco Company 2018). INMED-Karczewscy was awarded the Golden Emblem in the Highest Quality‘ Quality International 2018’ Award Ceremony in ‘Product category’ for LISSA ceiling pendants.